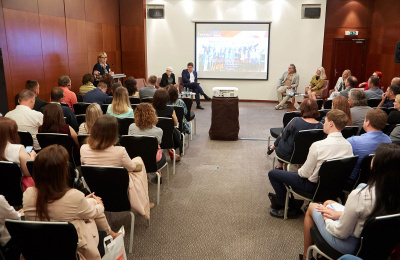 On July 5, the annual meeting of participants and organizers of the BATIMAT RUSSIA International Building and Interior Exhibition took place. During the event, leading manufacturers and suppliers, designers and architects discussed new opportunities for the exhibition event in 2019. In his speech, Alexey Striganov, CEO of MGC, noted that, in terms of content, market coverage and business program, BATIMAT RUSSIA is the number one project among similar events in Russia. «We are proud of this event and the level of professionalism of exhibitors and visitors, which once again proves that BATIMAT RUSSIA is one of the main landmarks in construction and interior market. This is a unique event where business, design and teamwork create the conditions for achieving a single goal," said the exhibition director. "During the four days of the exhibition, we witnessed the best examples of the creativity of designers in partnership with leading manufacturers and suppliers of finishing materials, ceramics, sanitary ware and other products. Now we can start preparing for the next season with an even greater desire to maintain our leadership in building technologies, interior solutions and responding to business and market demands». The successful 7th season of the BATIMAT RUSSIA exhibition, both in terms of attendance and in terms of quality of established trade relations, attests to its attractiveness and ability to involve people, which is noticeable even at the threshold of the exhibition halls. For 4 days, the exhibition was visited by 103 725 people from 56 countries, which is 13% more than in 2017. Alexey Striganov also noted that the organizers of BATIMAT RUSSIA, at the request of the clients, moved the exhibition dates two weeks ahead (March 12—15, 2019) and will continue their cooperation with the best exhibition venue of the country, the Crocus Expo International Exhibition Center. "We have a preliminary agreement on cross-support with our partners from Messe Frankfurt. Heimtextil is the largest business platform of the textile industry and the international exhibition in sanitary engineering ISH. I hope that this will help us make the sections of wall-papers, bathroom furniture and equipment more interesting, entertaining and replete", Alexey Striganov added. Larisa Vitalievna Novikova, CEO of KERAMA MARAZZI (general partner of the BATIMAT RUSSIA exhibition) spoke about her rich exhibition experience and advantages of BATIMAT RUSSIA. «Our company has been participating in exhibitions since 1993. Once we started with 16 sq m, and today we are already building more than 600 sq m, creating a romantic atmosphere of the French capital, like this year. The exhibition has played a huge role for us. Every year, introducing new collections and acquiring experience we become more interesting. We don’t slow down the pace and our aspiration to high quality. The exhibition is developing and attracting an increasing number of professional audience, including architects and designers. This audience is changing in quality as well. Exhibition organizers do a lot, and we are ready to help. I think we are all interested in exhibition development in many different directions. BATIMAT RUSSIA is the most effective tool for finding customers, partners, discovering new ideas, establishing valuable contacts. If you produce something that should take a worthy place in the field of architecture, construction and repair, you should be at the Crocus Expo in Moscow in March 2019. Otherwise, you just miss the moment», Larisa Vitalievna noted. The participants stressed that the BATIMAT RUSSIA exhibition gives impetus to development of innovative industries, promotes development of the construction industry in Russia, promotes international cooperation and establishment of business contacts and creates prerequisites for the growth of export potential of domestic producers. Elena Teplitskaya also addressed the guests and organizers of BATIMAT RUSSIA. «My friends from different cities of Russia come to visit this event, which traditionally takes place at the Crocus Expo. Given the richness of the business program, it is very important to properly "navigate" them. BATIMAT RUSSIA has a tremendous quality: it enables novice designers to participate in "actions" with partners from different sections. It is reasonable that BATIMAT RUSSIA undertakes the educational function as well. They have a unique opportunity to participate in BATIMAT INSIDE and WorldSkills competitions, panel discussions, workshops. This is the right direction», the designer noted. LEADER Group of Companies, Viporte Trade House, Alvero Factory, Amorim, Atlas Concorde, FAP ceramiche, BIOFA, SOLO Company, ESTIMA, Futura Casa, Galleria Arben, GROHE, JUTEKS, SIEGENIA, Silk Plaster, Silver Dragon Design, Studio-Line, Eco-Dush, TOTO, VEKA, ITALON Company, KERAMA MARAZZI, Kirov Ceramics, Kirovit, Mapei, Maria Furniture Factory, Mosplitka, Nichiha, PROFINE RUS, REHAU, Cersanit, SIRPI, Union of Manufacturers of Polymer Profiles, Henkel Bautechnik, Edvar, Elysium, Litokol, BRAER, ICE, ICEX, Liontex, LeDimore, IVC Group, UNILIN (Quick Step, Pergo, Balterio trademarks), Teplitskaya Design Studio, Victoria Kiorsak Interior Design, Vincenzo Studio Design, DETALI School, Stroitelny Expert Publishing House. The main topic of the meeting was the discussion of innovative ways for the exhibition development, long-term partnership on good and straightforward conditions, competitions for young professionals, expansion of business program, the Complex Solutions exposition, new projects and formats for discussions with Russian and foreign architects and designers.